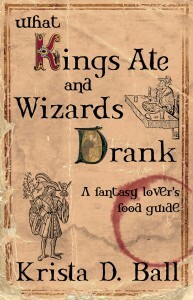 What Kings Ate and Wizards Drank – And a Giveaway! You GUYS! I am so excited! I have been waiting a LONG time for Krista Ball’s newest book – What Kings Ate and Wizards Drank. I was lucky enough to read an early version, and was TOTALLY HOOKED. Usually Krista is a fantastic fiction writer (I’m partial to her fantasy series Tranquility’s Blaze), but with her latest book, she’s branched out into non-fiction and let me tell you, you’re going to want to pick this one up. What Kings Ate will give writers of historical and fantastical genres the tools to create new conflicts in their stories, as well as add authenticity to their worlds, all the while giving food history lovers a taste of the past with original recipes and historical notes. She also has chapters called “The Marching Stomach: The Logistics of Feeding and Army” and “There is a Horde of Orcs Chasing me, Can we Stop for Some Rabbit Stew.” But it’s not all fun and games, Krista also deals with the serious side of food – how it can be used to control the classes, how poor people were fed, preserving food, etc. It really is a fantastic read, not only for writers, but for people generally interested in the history of food and eating. Trust me when I say if you’re writing a fantasy for NaNoWriMo, you’ll want this book in time to start your revisions in December! Because I’m so excited about this book, I want to give away a free copy to you guys. Just leave a comment with the grossest thing you’ve ever eaten by Midnight EST on November 11th and I’ll choose a winner at random Monday November 12th! I’ve tried some weird(ish) foods: Escargot, buffalo style frog legs… but the grossest TASTING thing was definitely Alligator marsala (mostly because I don’t even like CHICKEN marsala) just… ICK ICK ICK. I think that would have to be fish bladder soup (supposedly a delicacy). Or a fish eyeball in a type of spicy stew. A plate of mixed insects in China. Cicada’s two-ways (stir-fried and deep fried), scorpions, grasshoppers and larve. All on top of a bed of lettuce leaves for wrapping. The deep-fried fare tasted like burnt popcorn kernels. It was the ones that were still juicy that overdid it. Not as fancy as the other answers but an Australian friend of the family once made me a Vegemite and peanut butter sandwich. Vegemite, being the sludge left in the beer barrel after the liquid is all drank is bad enough on it’s own but the sweetness of the peanut butter only reinforced it’s salty, bitter taste and the stickiness kept it in your mouth longer. I’m Chinese. Nothing I’ve eaten is gross to me. 🙂 The bf has had fried crickets and ants, though they weren’t horrible he said. Tripe soup. I tried really hard to be open-minded about it–it was my first night in Romania and I was a guest—but–it was a gray, weird-tasting broth, and the slimy pieces of tripe floated like lost sting rays in it. I rarely try new things with reckless abandon–I’m a cautious taster. However, I was convinced that I would love kalamata olives before I had ever tried one (Thanks Rachael Ray) and took a huge bite of salad with an entire olive. I apparently hate me some olives. It’s hard to wretch discreetly at a restaurant. I have tried/disliked several foods, but this was the worst because it took me by surprise. I’ve tried a number of foods while traveling, among them octopus legs with the suckers still attached (which were decent) and yak butter tea (which was disgusting). I tried borscht once and hated it (not a fan of beets or of the spices used in the soup). But despite all that, the worst taste for me is still cilantro. Just smelling it nearby gives me this awful panicky feeling. It does not belong anywhere near me, much less in my mouth. I was a Peace Corps volunteer in West Africa, so the list is long…beef brain, tripe, cow hoof, bush rat, monkey, and chicken. Chicken you say…well, when someone serves a chicken, they serve the whole chicken cut up in chunks…white meat, dark meat, head, and feet!